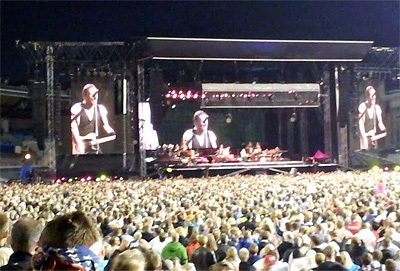 “Is Bruce Springsteen the one they call 'The King'?” said the guy sitting behind us while waiting for Bruce to start the show in Gothenburg a few days ago. “No, that's Michael Jackson, isn't it?” answered his girlfriend. “Ah! Now I remember, Bruce is called The Boss!” exclaimed the younger guy who started the whole conversation. The above conversation was overheard by me and my wife right before the Bruce Springsteen concert in Gothenburg on July 28. There being over 66,000 people in the audience, what were the chances of an Elvis fan like me getting seats just in front of a guy telling an Elvis story? Still, that's what happened. Unfortunately, another Elvis connection that I sat hoping for during the actual show, never materialized. The Boss didn't salute the King with a cover of “Burning Love” this time, like he did in Firenze, Italy, earlier this year on the same tour. My wife shouted “Burning Love” valiantly a couple of times, but with thousands and thousands of screaming Bruce Springsteen fans between her and the stage, it was a hopeless effort. Still, the show was a fantastic one, and the day after I watched the “Burning Love” performance on YouTube, noticing that it was sung on my birthday, no less. Kind of an Elvis connection as well, I guess. Technical advisor for this post was my wife.